One day as his coachman drove Bergh through the streets of St. Petersburg, he spied a Russian peasant viciously beating his horse about the neck with a heavy stick. The horse was struggling to pull a heavy droshky-a four-wheeled open carriage, but with an injured foreleg could not move quickly enough. "Even though I could see that it was only a horse being cruelly whipped, I still heard the cries as if they were the suffering of a tortured human. This burned like a brand to my soul." He asked his elegantly attired coachman to halt. "I could see the tracks of tears running down his cheeks--the same tears that would signal anguish in a tormented child," he recalled. "Tell that oaf if he doesn't stop I'll get down there and whip him!" Henry Bergh was the unlikeliest of do-gooders. With an inherited fortune, he was a dedicated dilettante who drifted away from college, a dabbler in the dramatic arts whose plays were frequent flops, a dandy who affected fur-lined capes, top hat and spats, and whose only job apart from a short stint in his father's shipbuilding business was a political appointment to a diplomatic post in the court of the Russian Czar, a position he also found enervating. But his experience with the Russian driver and his horse energized and inspired him. "I made up my mind that when I came home I would prosecute those who persecuted poor dumb beasts. Mankind is served by animals, and in turn they receive no protection," he wrote. But Bergh had only begun. A savvy promoter, he made use of the publicity his activities drew from the many newspapers in New York to draw attention to all shorts of cruelty to other animals--spit dogs who ran sixteen hours on wheels to turn meats over a fire and pit dogs who fought for blood sport gamblers. He was the champion of chickens, scalded and plucked alive for butchers, sea turtles kept upside down for weeks while ships freighted them to soup chefs in New York, even rabbits, cats, and especially cattle and pigs on their way to the slaughterhouses. He even took on P. T. Barnum's treatment of circus animals. People were used to thinking of animals as insentient beasts, born only to serve man, and Bergh was ridiculed as "The Great Meddler" at all levels of society. Cartoonist Thomas Nast lampooned him in sarcastic caricatures, but Henry Bergh, former symbol of the idle rich, was charged with his mission of mercy and roamed the streets tirelessly, exposing cruelty and lecturing to any groups who would listen. Little by little people saw the need for changes in their ways of treating animals, and in 1866, he formed the American Society for the Prevention of Cruelty to Animals, the ASPCA. Soon, with new animal protection laws and cadres of agents, Bergh continued to roam the streets to enforce humane treatment of animals. He even turned his attention to the mistreatment of children, some of whom had taken the place of the dogs who had turned spits and drew carts through the city, leading to the Society for the Prevention of Cruelty to Children, which became a national cause, bringing an end to child labor at last in 1938. "Mercy to animals is mercy to mankind." 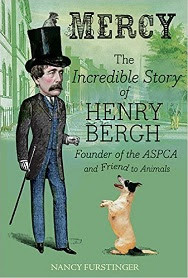 Nancy Furstinger's Mercy: The Incredible Story of Henry Bergh, Founder of the ASPCA and Friend to Animals (Houghton Mifflin Harcourt, 2016) tells the story of Bergh and the movements he founded in the United States with style and verve befitting the man himself. Her lively and witty narration is set off by charming retro-styled colored drawings by Vincent Desjardins, beginning with the arresting full-page illustration of Bergh, in cravat and spats, leaping dramatically down from a skylight into a pit where two dogs are being forced to fight to the death. Well documented, this book offers an ample appendix--with period photos and engravings, timeline, quote sources, bibliography, and index--for young research writers and should be a first purchase for school and public libraries.